This koi painting takes a different view than my others which were seen from above the pond. In this scene, we go below the water's surface and see the lily pads from underneath with the light filtering down from the surface. 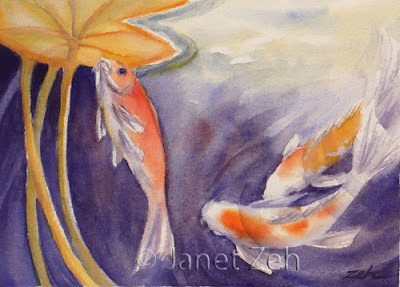 As in all my paintings of koi, this is done with a limited palette of three primary colors. See my paintings for sale at JanetZeh.Etsy.com. Thanks for stopping by and have a great day!